Vivians caught fire in the second half, scoring 19 points on 7-of-8 shooting. She shot 5-of-10 from 3-point range for the game and also hauled down nine boards. Morgan William added 12 points and five boards. Tennessee opened the fourth quarter with high energy, scoring the first four points of the quarter to cut Mississippi State’s lead to 43-41. The Bulldogs responded with a 15-7 run over the final eight minutes of the game. Vivians scored 14 points in the third quarter and knocked down a 3-pointer just over four minutes into the second half to give MSU a 10-point lead at 36-26. Vivians and Nared traded a pair of long 3’s in the final 25 seconds of the third quarter, Morgan William made a free throw with fractions of a second left and the Bulldogs took a 43-37 lead into the fourth. Mississippi State took control of the game in the second quarter and took a 25-22 lead into halftime thanks to 11 first-half points by Vivians. The Lady Vols came up empty on eight of their final nine possessions of the first half as he Bulldogs outscored UT, 15-7, in the second quarter. The Bulldogs went 5-of-10 from 3-point range in the first half. Tennessee led after the first quarter, 15-10. The Lady Vols forced Mississippi State into bad shots early on as the Bulldogs opened the game shooting 3-of-15. UT closed the first quarter with an 8-0 run over the final four minutes. The Lady Vols are 36-2 all-time against Mississippi State and 4-1 against the Bulldogs at neutral sites. UT is 0-2 against Mississippi State this season. Mississippi State earned its first-ever win over Tennessee on Jan. 28, edging the Lady Vols, 65-63, in overtime in Starkville, MS.
With her first rebound at the 8:27 mark of the first quarter, Bashaara Graves became the fifth member of Tennessee’s 1000-rebound club. Graves joins Chamique Holdsclaw, Glory Johnson, Shelia Frost and Tamika Catchings as the only players in Lady Vol history to record 1000 points and 1000 rebounds. With 15 rebounds, Graves passed Catchings (1,004) for fifth most in Lady Vol history. Graves now has 1,014 rebounds in her career. Graves also scored five points to pass Angie Bjorklund (1,469) for 23rd place in school history. She now has 1,471 career points. Graves recorded 15 rebounds, her second highest total of the season. 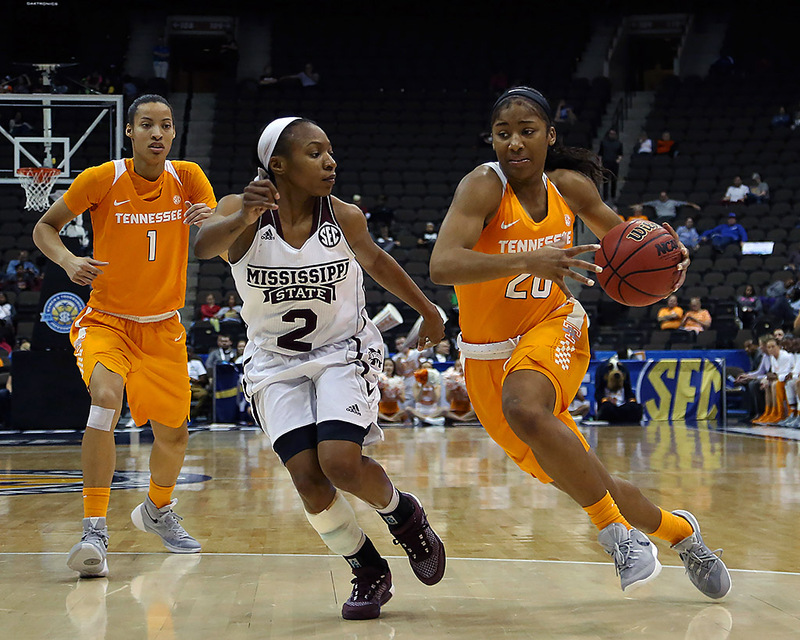 The Lady Vols held Mississippi State to 32.1 percent shooting. It is the 24th time this season they have held an opponent under 40 percent and the 14th time over the past 15 games. Tennessee limited Mississippi State to just 28.6 percent shooting (8-of-28) in the first half. Mercedes Russell blocked four shots to move into the school’s top 10 list for blocks in a season. Russell now has 62 blocks on the year, passing Sheila Frost (60 blocks in 1987-88) for 10th place. Diamond DeShields scored 20 points for the eighth time this season and third time in the past four games. This is the 14th time a Lady Vol has scored 20 or more this season. The NCAA Division I Women’s Basketball Championship bracket will be announced Monday, March 14th at 7:00pm ET/6:00pm CT on ESPN. First-round and second-round competition for the 2016 NCAA Division I Women’s Basketball Championship will be held March 18th-21st on 16 campus sites.